Click here to view the interactive webinar, Harnessing the Power of Data, on August 9th, 2018. RELATED PROJECTS: See the “mini-portraits” made by service-delivery organizations for the Community Portraits Project and explore 300+ well-being indicators on DATA2GO.NYC. The American Human Development Index, a supplement to the gross domestic product and other money metrics, tells the story of how ordinary people are doing. The index is based on the Human Development Index developed by the United Nations, the gold standard for measuring the well-being of people in every nation. 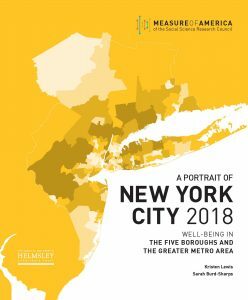 This report presents the ranked index for 170 neighborhood and town clusters in the New York metro area; for the five boroughs and for 188 neighborhood tabulation areas in New York City; for the four major racial and ethnic groups; for women and men; and for US- and foreign-born residents. 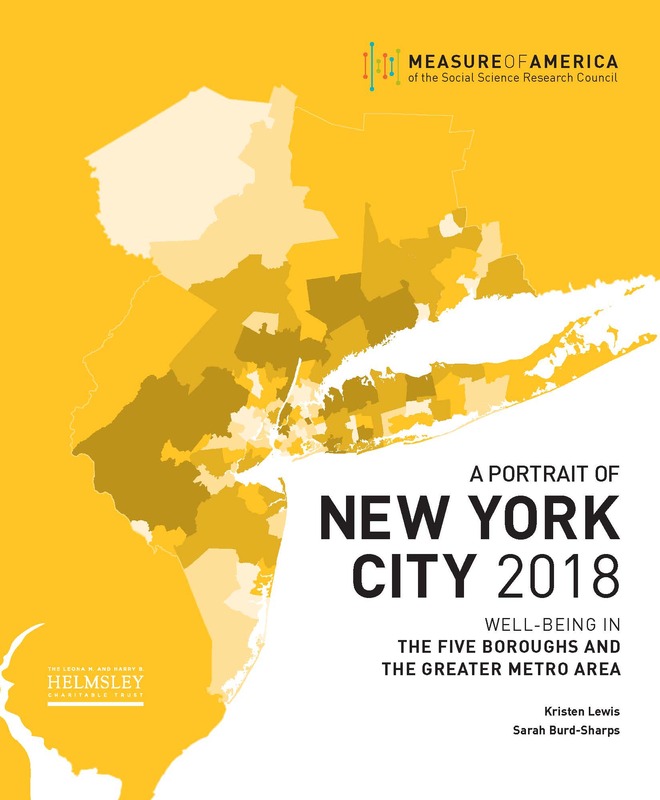 The American Human Development Index score for the greater New York metro area (6.32) is higher than the score for the city proper (5.98) and the United States as a whole (5.17). Despite a longer life expectancy and higher education levels, women scor e slightly lower than men on the index (6.25 vs. 6.30) due to a $12,500 gender earnings gap. Of the four major racial and ethnic groups studied in this report, Asian metro area residents score highest on the HD Index, followed by white, black, and Latino residents. The Asian and white scores are similar (7.54 and 7.16, respectively), as are the black and Latino scores (4.87 and 4.83). The top-scoring neighborhood and town cluster of the 170 analyzed in the metro area is the Upper East Side in New York City (9.36). This area also scores highest in terms of education. The highest earnings are also found in Manhattan, in Battery Park City, Greenwich Village, and Soho. Southeast Westchester County fares best in terms of life expectancy. Southwest Newark, New Jersey has the lowest HD Index score and the lowest average life expectancy. The Hunts Point, Longwood, and Melrose section of the Bronx has the lowest education score, and Belmont, Crotona Park East, and East Tremont, also in the Bronx, has the lowest earnings. New York City scores 5.98 out of 10 on the American Human Development Index, higher than the United States but lower than the New York metro area. The city also has higher highs and lower lows than the greater metro area. On average, Asian and white New Yorkers enjoy relatively high levels of well-being, while black and Latino New Yorkers have HD Index scores below the city average. White residents have the highest score (7.63) and Latino residents have the lowest (4.58). Women score higher than men on the HD Index (6.16 vs. 5.87) due to higher average life expectancies and education levels. Carnegie Hill on the Upper East Side has the highest score (9.34) of all 188 NYC neighborhood tabulation areas. Of the ten highest-scoring neighborhoods, nine are in Manhattan and one is in Brooklyn. All ten lowest-scoring neighborhoods are in the Bronx. Claremont-Bathgate scores the lowest (2.71). HD Index scores can be used to track improvements over time, but in a city where neighborhoods are rapidly transforming, it can be difficult to determine if rising well-being levels are due to better outcomes for existing residents or to changes in population demographics. According to an analysis of the racial compositions of the fifty-nine NYC community districts since 2000, the black share of the population has decreased by more than 5 percentage points in fourteen neighborhoods. At the same time, many traditionally black and Latino neighborhoods experienced an influx of white residents. A child born today in New York City can expect to live for 82.3 years. If New York City were a country, it would rank eighth in life expectancy, tied with Sweden. Foreign-born New Yorkers can expect to live six years longer, on average, than those born in the United States. This life expectancy advantage tends to fade the longer immigrants live in the United States. There is a five-year life expectancy gap between NYC men (80.2 years) and women (85.3 years). More than a decade separates the life expectancy of the city’s Asian residents (89.3 years) and its black residents (79.2 years). Latinos and whites fall between the two; Latinos are the second-longest-lived group (83.5 years), and whites are the third (82.6 years). There is a thirteen-year difference in life expectancy between the longest- and shortest-lived NYC community district; residents of Bayside, Douglaston, and Little Neck in Queens have a life expectancy of 89.6 years, compared to a 76.7-year life expectancy for residents of Brownsville and Ocean Hill in Brooklyn. Heart disease and cancer are the two leading causes of death across all four racial and ethnic groups, but black New Yorkers are more likely to die from preventable causes such as infant death in the first twenty-eight days, HIV, and homicide. New York City scores 5.45 on the Education Index. Although New York scores higher on the Education Index than the United States as a whole (5.45 compared to 5.17) due to higher levels of bachelor’s and graduate degree attainment, almost one in five adults in the city lacks a high school diploma. On average, women in New York City have higher educational attainment levels than men, with an Education Index score of 5.52, compared to 5.37. Education Index scores of US- and foreign-born New Yorkers are separated by nearly three points—6.44 compared to 3.54. Foreign-born New Yorkers are less likely to be enrolled in school and less likely to have attained a high school, bachelor’s, or graduate degree. Educational attainment and enrollment rates for immigrant New Yorkers vary considerably by race and ethnicity, however. White residents score the highest on the Education Index (7.67). Asians score second highest (5.76), but educational outcomes vary considerably by Asian subgroup. Black New Yorkers come in third (4.54) and Latino New Yorkers have the lowest score (3.24), though, again, educational attainment varies by subgroup. Education Index scores vary tremendously across New York City neighborhoods, ranging from Carnegie Hill on the Upper East Side, with a score of 9.50, to North Corona in Queens, which scores just 1.38. Low Education Index scores are associated with higher rates of poverty, child poverty, unemployment, incarceration, and births to teenagers. Higher education scores are associated with higher median personal earnings. NYC median personal earnings are $35,934, above the US median of $31,416. The typical white worker takes home $52,290, over $20,000 more than the typical Asian or black worker (with median earnings of $32,156 and $32,059, respectively) and twice the earnings of the typical Latino worker ($25,086). 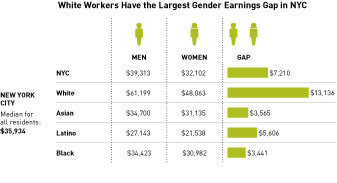 Men earn $7,000 more than women in NYC, despite women’s superior performance on the Education Index. The gender earnings gap is widest for white workers—white men typically earn $13,100 more than white women in the city. Black men and women have the smallest gender earnings gap, likely a sign of disproportionate discrimination faced by black men rather than an advantage for black women. US-born New Yorkers make $11,000 more than foreign-born New Yorkers. NYC Asians have the largest gap: Asians born in the United States earn over $18,000 more than those who immigrated. Earnings range from a median of $95,000 in Carnegie Hill on the Upper East Side to $14,400 in the Bronx neighborhood of Belmont. Over 50 percent of New Yorkers qualify as rent burdened (spending more than 30 percent of their incomes on rent and utilities), the third-highest rate of the ten most populous US metro areas. There is a strong negative relationship between incarceration rates and earnings in New York City neighborhoods. The report concludes with an ambitious but realistic goal: to increase well-being for all city residents and narrow the gaps between groups, resulting in an increase in the HD Index— from today’s 5.98 to 6.60 by 2025. HEALTH: Structuring neighborhood, school, and work environments such that the healthiest choices are also easy choices and addressing the particular health challenges of black New Yorkers will extend life expectancy for all and achieve significant gains for the group with the lowest life expectancy. Investing in the social determinants of health in black communities and reducing antiblack racism, which exacts a heavy toll on the health of black New Yorkers, are particularly important. 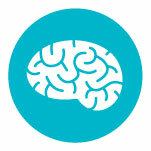 Target: Increase average life expectancy by one year, from 82.3 years to 83.3 years, by 2025. EDUCATION: Better educational outcomes require that we address the social and economic disadvantages that threaten children’s stability, protect them from harm, and promote healthy cognitive development in the early years; improve school quality such that all children have good choices; and address the disproportionate rates of youth disconnection among black and Latino young people. A focus on Struggling NY and Precarious NY and on Latinos citywide will help narrow the gaps in educational attainment and quality. 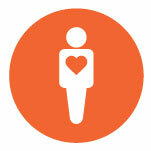 Target: Increase enrollment by 6 percent and boost adult educational attainment by 6 percent by 2025. EARNINGS: Increasing wages, addressing the affordable housing crisis, reducing the toll of justice involvement in high-incarceration neighborhoods, and reducing the gender earnings gap will lift median personal earnings, enabling greater economic security and a chance for all New Yorkers to invest in themselves and provide a safe, stable environment for the next generation. This will require a laser focus on workers whose median personal earnings are very low, namely those in Precarious NY (under $22,000 annual median personal earnings) and Struggling NY (under $29,000). 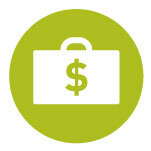 Target: Increase median earnings by $4,000 by 2025 (in inflation-adjusted dollars).